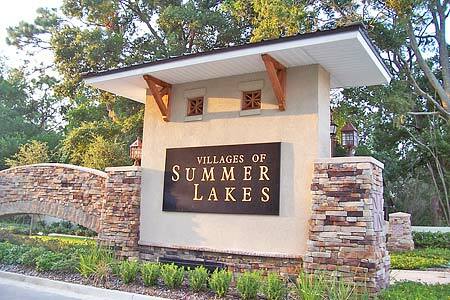 Villages of Summer Lakes townhome community in Jacksonville, Florida. The Villages of Summer Lakes is a townhome community by KB Homes conveniently located in Southside's Tinseltown area. The quiet community is setback from the fastpaced Southside Boulevard by a quarter mile landscaped drive and is just a hop, skip and a jump from downtown, interstates, as well as great shopping, dining and entertainment. The Villages of Summer Lakes offers maintenance-free living and spacious townhome with attached 1-car garages in a variety of floor plans featuring 2- and 3-bedrooms, 2.5 bathrooms, 9' ceilings on the first floor, 2" faux wood blinds on all windows, security system, knockdown ceiling texture, architectural shingles, covered rear patios, landscape package with St. Augustine sod and irrigation system, full stucco exterior and stacked stone accent on front elevations. Amenities include swimming pool, playground and a large natural lake within in the community. The proposed city park with recreational facility at the front of the community is scheduled to open after 2010.